"Knovio as a tool in online teaching"
Knovio has come quite a long way since I first used it about 5 years ago--I love how responsive the company has been to improvement suggestions. I love that you can edit your recording and replace slides--especially helpful when you teach a course across two semesters and need to change a date! I have a hard time finding something I dislike--but I do get annoyed by the recording check every time! I believe you can change this in the settings--but I always overlook this when creating lectures. This really is the easiest way to develop lessons in online classes--we have an organizational type account for a specific educational program and share our materials. We also have our own accounts that we can use instead--but the ability to help one another with content is really beneficial to students. This is a great way to emulate short lessons in an online class. The look is far more professional than just a video or even an iMovie would be. "Extremely useful tool for creating video content"
Ease of use and ability to quickly make changes to content; support for Cloud hosting of content as well as export to MP4. The ability to create in-line tests is also really helpful. Support for importing existing video and audio, plus the ability to match up audio with a presentation, is really useful. Ability to invite others to create content without requiring a separate license. Fantastic support team; very responsive and quick to solve problems. Limited editing capabilities for imported content often requires a third-party editor; reliance on Adobe Air and Flash for some functionality; single sign-on support costs extra; rendering MP4 video for export can take a long time. No ability to have multiple collaborators work on a single project; Knovio is limited to only one content creator per project. Knovio is a great tool for creating basic video recordings. It is not a replacement for a product like Camtasia, which provides a lot of advanced features. I find myself using both products for different reasons--and sometimes at the same time. For example, there are times when you still need to edit a video that Knovio creates, and the "Knovio Studio" capability, which provides limited editing capabilities, generally does not provide what I need other than basic trimming of existing video/audio content. In those cases I often still need to pull that content into an editing tool. So don't consider Knovio a complete replacement for other authoring tools, but it is a great asset for quickly and easily creating videos using people that are not very technical. 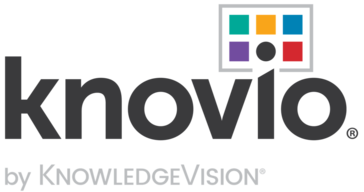 We use Knovio to create video-based sales training content. Previously, it was very difficult to get remote subject matter experts to create this content, as many are not experts on creating video, which required a lot of hand holding. It was also difficult to create the videos, as we generally had to jump on a WebEx or Zoom video session and record the entire thing in one 'take' and then edit it post-production. Adobe Flash. Recording is done on a slide-by-slide basis, which means that the SME can easily re-record just one slide, rather than requiring another "take" and then having to edit out the bad one. Knovio also allows us to easily publish videos, either through their own platform or by exporting the final video to MP4. It also supports various learning management systems and video hosting/publishing platforms. "Just the BEST tool for learning & training needs!" As a learning expert, I often find it difficult to get the most talented corporate citizens to show up and share their expertise with new or more junior audiences. They're the most busy people in any organization precisely BECAUSE of their deep knowledge. So how does an organization download the important expertise residing in the minds of its most successful employees....to the minds of new or aspiring employees? KNOVIO is the answer. With Knovio, I can easily have experts record short or long presentations, which means their wealth of insight can be shared many times with many others - without imposing on their schedules. Knovio is very easy to use to create a synchronized presentation on an iPad - even for a subject matter expert who hasn't used it before. It means we don't need huge budgets any more in Learning & Development for videographers and editors!!! It makes "just in time" audiovisual learning materials easy and cheap to pull together for the organization. I highly recommend this wonderful product!! They recently have added hosting capability for videos and presentation "flip decks" -- very cool! No real issues with it - it does what we need! Reduces our L&D budget while greatly expanding our library of just in time learning materials. Experts enjoy creating Knovios and those trying to learn LOVE the way Knovio makes video easy to navigate and use. "Excellent Tool for Communicating with Clients and your Employees"
I love that Knovio is so highly user-friendly. They offer training videos and webinars and are always very responsive when I reach out with a question. My one recommendation would be to make sure you get a high-quality microphone so the sound quality is good. It gives our clients multiple ways to communicate with their employees, it also gives us the opportunity to communicate with our employees. Our clients really love the voice-over presentations that detail their benefit options, and they really like that they can send a link out to their employees and they can access the video from home or while traveling. I like the ease of use with this program and the ability to customize and brand the look of the content. The best part is the analytics associated with the program and the level of drill down options it gives. Also, they take customer feedback seriously and are updating the platform as a result. I would like to see the ability to upload more file types. Also flash player is becoming problematic but I think they are looking to get away from it. This is a very cost effective way to get information out to a large group of people. We use this to train our customers and staff. We have separate "showcases" or areas for them to log into. It has helped us reach more customers and has been used by our sales reps to incentivize them to get free product. For our staff training, it makes on boarding much easier and allows for them to come to a live training class prepared. The different options available for putting together training presentations. I like being able to store videos there and share them since SharePoint doesn't allow me to upload videos. I like that when you share a link, you can include a password so only people with the password can view the presentation. I also like the analytics so you can see how many people viewed published materials. I tried to upload a video using Knovio Project but it did not work for me even though I did it correctly. I had to get help and someone from Knovio and they did it for me. It was inconvenient but their support was prompt. This is good for training videos, narrated PowerPoint presentations and is relatively simple to use. A way to distribute training presentations. We record PowerPoints or videos that walk through our electronic tools and provide them to our customers. "Affordable and easy for creating high quality narrated presentations"
Ability to send narration invites. Ability to record videos. Ability to upload Power Points, videos, audio. Great reporting tool including intriguing engagement scoring system. Quiz tool needs improvement. Not enough questions types. Shows no score to end user. Need ability to control completion via slide views and/or viewing %. Child/parent slide approach for Power Point animations confuses our users. Their customer support is outstanding. They were particularly helpful in making sure their SCORM exports would work with our LMS. 'This tool substantially reduced the cost of creating narrated presentations and video presentations. We switched from Brainshark to Knovio and essentially have the same tool for far less. Plus this tool lets us keep presentations internal in our LMS (SCORM) or make them external-facing for clients/contractors. Love its engagement reporting as well. "Very clever and fast software." I working with this software and I'm glad that I can make a great presentation. Also good chance to share with social media. Perfect way downloads everything that I need. I don't have any issue with this software. I really like all of way ow this platform. Very powerful work for all working team. Big helper. Good support service and very fast. Great software for all working team.Very easy way to understand. Simple of use. All program are concentrate on the profecional side. Will give a higher quality of work. In our organization,we can add videos in one click. Very fast work with it. We can save a lot of working time. Helps to track information about customers who are interesting about our product. It helps users to upload presentations as well as videos and audios. For arrange the various types of slides it also very useful and efficient. Whenever I share link , I am able to include password which provides security. Custom reports are not created and not that much responsive at that period of time otherwise there is nothing about trouble that I've facing. It is very easy to use for new learners and also allows them to make new presentations and share as per requirements.So, recommend for all who wants to work with the tool which provides efficient and convenient way for making good presentations. It allows to share our contents and also helps to make presentations perfectly. Incredibly easy way to use video communications without the technical complexity of other solutions. There are features in Knovio that I would use sporadically but I can’t justify the license upgrade for my limited usage. If you are in doubt if video is for you, do the trial. You will get access to all the product capabilities and can do real work to see if Knovio is a fit for you. Knovio let’s my communications “standout” in a good way. People have told me they appreciate me “being there” when I physically can’t be. Using Knovio, I’ve been more successful building trust with my business contacts and enjoy a reputation as being a bit of an innovator. Having the ability to e-mail someone for help and get a response quickly as well as having a webinar with them. Sometimes some of the features are difficult to find. It is most difficult to edit the videos. The recording can be complicated to do because sometimes you can hear the click of the button when you press stop. This makes the video seem unprofessional. Also, when trying to edit a video, you want to rewatch it in totality very often to see the changes. In order to watch the clip in totality, you have to preview it. It would be better to just be able to watch the clip in parts like it is possible to do in iMovie. Further, when you do preview it, the buffering takes a LONG time. Even when the video is about 2 minutes long, it takes a long time to load. This prevents you from making progress quickly. I like the ease of use - it takes a little getting used to know which feature would be best suited for your needs, but once you are up and running its pretty user friendly. The tools are great for arranging the slides. Also - the people at Knovio are GREAT! We've had a good experience with the people who pitched us the product as well as provided support along the way. There is some confusion with adding audio files to slides at first, it can get messy quickly. A drag and drop feature would be great! If the files are not carefully labeled before upload, matching them to the slide is really confusing. I also had a hard time with the audio test - the steps were a little bit unclear. We are able to easily train clients on our product by simply directing them to our showcase. Trainings by a CSR or other associate which would normally take an hour, can be completed with an email to the showcase! It's been a time saver all around. "Affordable, Powerful, and Reliable Hosting Services "
The product has really evolved over the past year; you can tell the developers and engineers are hard at work streamlining and adding new features. With the new capabilities I feel I get even more value for my money. The analytics are powerful; however, I feel creating custom reports could be improved. Their customer support is fantastic, and you get a lot of value for your money with the product. Knovio allows us to distribute our content to 600+ stores, our corporate campus, and distribution centers quickly and reliably. The analytics feature continues to help us craft out content to ensure we're delivering what our viewers want to see. "KV - The First Six Months"
I like that KV is easy to navigate and produce presentations. I also like that it is easy to share with business partners and they can send out as needed. I would like to see and Android app. Also the timing on the animations is not adjustable (at least that I know). It would be nice to go back into a recorded presentation and tweek the animations so they are precisely where you want them. This platform will definitely serve my purpose when I become proficient with it. I would say plan on a longer learning curve that what you are told up front. It was introduced to me as super easy and intuitive, that you dint need any skills to use it. I found it to be somewhat complicated whit different "suites" to learn. All of the features could be in the basic production area without moving to other applications. Over all very good performance and I will be using it extensively moving forward. I am an educator to employer groups. My presentations focus on how to use the health insurance coverage they have including, terms, locations, costs, etc. KV is nice because you can use an existing PP presentation and integrate video if desired. The benefits have been good because with a recent account we were able to reach 2800 employees with our message in just a few days. i am in the process of recreating a number of my existing voice over presentations to KV. "Slick program for replacing in-person meetings"
KV is easy to use, with a quick learning curve. It is intuitive and works the way it's supposed to. It's also flexible enough to customize for many different purposes. I would like to be able to create my own "templates" with only the exact features I want (without having to contact KV support to create a custom template). This is not a major issue but if I have to choose something I dislike, this would be one thing. Definitely give it a try and work with the support/sales team to meet your personal needs. I have found the service second to none and KV really wants to work with potential customers to make sure they are happy through the buying and renewal process as well as during the contract year. My company provides benefits education to the employees of our clients. We deal with close to 100,000 employee lives. Instead of traveling around during our busiest times of year, our benefit managers can now have me produce a virtual employee meeting for our clients to use. Our clients' employees love the videos which they can watch at their convenience. "Good interface, recording and lead tracking system"
For our company we need the system to integrate with our marketing automation platform. Currently this is not something KnowledgeVision has worked out. I think that if you are looking for a system that will allow you to record webinars, training tips, or voice over presentations this is a great software for you. It allows you to integrate the platform directly on your website and captures individual sessions seamlessly. Where our company struggles and are looking to get a better improvement would be in the integration aspect of the software. We need something that is going to allow us to integrate into our marketing automation platform and help score the individuals based on the length of time they watched and interacted with the video. Ease of delivering content to the right audience. Needs a simple, inexpensive solution to display all the content we create in one spot - without additional add-on fees. The biggest stumbling block with a tool like KV is not the tool itself - it's the content planning and creation. If you can get that together, then KV is a simple tool with lots of perks. One thing to consider, if you are a large corporate client with stringent IT guidelines on installing software - there are frequent updates to the installed tool, so be prepared to submit tickets regularly to get those installed. The online "lite" version doesn't require this, however. We use KV to distribute training to various audiences. Without a full-fledged LMS in place, it's allowed us to accomplish this. "Easy to collaborate and manage"
Knovio is very efficient and user friendly tool. It provides content system and also screen recordings which become quite useful for me.Template system is good feature provided by this tool. Nothing because this tool is able to fulfill my requirements so no issues regarding this tool. Recommend specially for people who used to organize videos and wants to collaborate with others. This is helpful to transfer knowledge and for sharing of information. I am able to start self service videos and also hosting it, manage it and make it efficient by myself. "Knovio is a great product to use." It is extremely easy to use and to learn. I am new to the product and have found navigating the tool fairly easy. I would like to better understand how to make my presentations look like a professional production as opposed to a power point with voice over, am looking forward to learning how to do this. I am new to the product, so I have not used it enough to know what I dislike. Take is for a test drive. Create a simple presentation so that you can realize how easy the tool is to use. It helps with communications and reaching audiences who do not read emails. Has helped with annual enrollment, new hire benefit communications, and new employee orientation. "Knowledge Vision and Eaton Vance"
The ease with which a standard PowerPoint presentation can be made interactive and generally enhanced and the ability to customize surveys within a presentation. The tool has really helped for our required internal trainings. At times the user interface (UI) of the product can be a bit counter-intuitive for users who doesn't use the tool daily - it can be a little clunky getting around. Additionally, the upgrades and updates for the tool should be automated. Being told that prior work will be erased if you don't download the new version isn't best practice. Making presentations more interactive and valuable for viewers and also providing training opportunities internally are our main users. Recently, internal usage has been the focus. Ease of content management and template system. Features are advertised without testing, I feel like a beta tester for KnowledgeVision sometimes. Example of this would be KVTrack/Wufoo integration still being broken more than 9 months after I told them about the broken implementation. There is no ability to set individual slide sync for HLS & RTMP streams, this means that over the course of a long stream your HLS video is falling behind your RTMP stream and as you only have the ability to set 1 slide delay (in seconds) then you have to decide if your mobile or desktop viewers will have a compromised experience. This is obviously not ideal. Because of the above I actually avoid using KV's slide syncing ability on ALL live streams. It is not suitable AT ALL. Slide sync works well for On Demand pre recorded webcasts but absolutely not ready for live streaming. I was able to add images directly into the guestbook title using <img> tags, this feature suddenly turned off one day without warning. When I enquired about it I was told that I discovered an "easter egg" and that it should not of worked and that they have now gone out of there way to explicitly remove the feature. Removing this feature would be fine if KVTrack/Wufoo integration worked as advertised as then I would of had a way to have a pretty (read: branded logos) registration forms. But it simply does not and to make matters worse II have been given no firm ETA on someone even looking into the broken KVTrack/Wufoo implementation. So when a developer removes a perfectly fine working feature, and then points to a feature (KVTrack) as an alternative that is broken it does not look great on your organisation. I actually had to tell the support person (Lauren) that removing my guestbook "easter egg" was bad as the proposed replacement feature (KVTrack) was broken and that I was the one to tell KV's support team of this. Due to the above I actively go out of my way to use as few KV specific features as possible so that we can move platforms more easily when/if the time comes. This is a small operation, this can be a blessing and a curse. They are lovely people to work with and they do listen to your needs, they just need to learn to not stretch themselves on constantly adding new features when their core could be stronger. KV is not our ideal solution to any of our problems, it is barely sufficient. We need our issues looked at and taken seriously. "Onboarding new team members is easier with KV videos"
Onboarding new team members is easier with videos. Subject matter experts record their presentation and only need to take the time to deliver it once. Updating their presentations is also very easy swapping out the old slide, substituting the new one and recording the audio for only the new slide. I like knowing who has viewed the presentations and how engaged they were with them. We use the Showcase so all of our content is available in one location and it has the custom look we needed. Support is good and they KV team was very helpful and easy to work with when we needed them. KV has and continues to be a good solution for us. There is nothing we don't like about KV. They have delivered as promised. KV is a great way to get started in self service video with very little investment or expertise. It won't take long to evaluate it. onboarding new team members. Knowledge transfer is faster so new people become productive sooner saving time and money. I like that it's pretty easy to use. I'm not the primary user, but I help other staff learn how to use it and troubleshoot any problems they have. Animated slides splitting into multiple slides is a little confusing at first, but in the end it all makes good sense how it actually works. Do it, the price is right, the support is AMAZING, they even offer training, I mean I have no doubt that they can and will help you figure out how to do anything you can come up with. a wide variety of clients and how to reach the ones that are almost disengaged, but still have some hope left and think that a video is much better than making a phone call or looking up all they need to know. "Effective Platform, Easy to use"
It's simple to get started adding content. When used in conjunction with a platform like Constant Contact users don't need to "log in" to the software. This was a key factor in our decision to go with this provider. when using a combination of video presenters and slides the system can be a little sluggish. It runs best on Chrome or Internet Explorer. We have intermittent issues with Safari users. Have one main 'administrator'/'trainer' for the system. Remote orientations, just in time trainings are the main reason we use the system. It has helped significantly in these areas. It is very efficient and convenient tool for making videos and managing it online. Also, video communications is provided by this tool. It is easy to learn and also provides good user interface which is user friendly. Sometimes, it consumes long time whenever I am dealing with video communications otherwise there is nothing about dislike. This tool allows to make presentations efficiently and also provide video communications. So, quite helpful and recommend it to for people who have such type of requirements. For making videos and also managing it with flexibility. Also, it is useful for making various slides in presentations. "KnowledgeVision is a great tool!" I love the tracking functionality - being able to see how long and on what part of a presentation the attendees focused is very helpful for our sales team. Updating the background for our format is challenging, I'd like more ease of use on the backend. We have been using the tool to train internal teams primarily, but have been branching out and using it as a customer facing tool lately. The benefits we've reaped are understanding engagement from a consumer standpoint - our team is pretty good so it's nice to see the real-world application. "Intuitive and easy to use tool that is scorm compliant"
Intuitive, easy, user friendly. Basically anybody could use the tool to publish a SCORM compliant training. LMS Integration. I don't like all the separate tools. It makes it confusing. Accessing the different parts and understanding which one to choose can be confusing and tricky. Flash-based is giving us problems with our IT department keeping Flash updated. Look into the different tools and capabilities with KV. Easy solutions. Allows score compliance outside of LMS. Can publish PPTs and Webinars with storm compliance in a simple process. A SME can use this tool to record training if needed. "KnowledgeVision was a game changer for SigEp"
It's SO easy to use and the video quality is great! You don't need an entire IT team to make this happen - trust! Can't say I dislike anything about the product or the team that works to get this up and running for you. We use the product for so many things now at SigEp: new volunteer on-boarding; getting attendees best prepared to attend our Leadership events; quick ten-minute training videos; new product rollouts - the list goes on and on. Our volunteers love this product and today I can't imagine life without it! KV provides the ability to package video, attachments, and links to resources in one deliverable, available to anyone with a web browser. We use KV for learning, rather than sales, so building a single package is a benefit. We always want better quizzing and interactive features. I would like more flexibility in how to create custom reporting. Providing learning across our enterprise, outside of firewall constraints. Benefits include access, and some robust data analytics. KnowledgeVision is cheaper than the competition and has done some work on uploading times and ease of use. KnowledgeVision requires a person to input their information each time, instead of remembering the IP address. We use Knowledgevision to host our videos for our clients. It will generate an embed code for each video. There is a large footnote area below the video, allowing us the ability to place disclosure there and stay in compliance. Thanks for your feedback, we always appreciate hearing from our customers. I can totally appreciate frustration with buffering and the audio/video not being in sync. This is often the result of low bandwidth and/or firewall configurations. We work with clients all the time to address this issue - please give us a call or email us so we can resolve this for you. Guestbook registration requires cookies being enabled to remember user profiles. We recommend reminding users to enable cookies to achieve a better experience. KV Studio has become my best friend when developing content for my company. The application is easy to move around and for those who are not as tech savvy, it is as easy as using Word (just my opinion). The analytics is not as easy to use when tracking the traffic of viewers. I am basically developing content and it is the ease of use. "Knowledge Vision helps us deliver the entire package"
Love Knovio's ability to record online presentations locally, making It quick and easy to publish new material in a timely manner. Customer service is fantastic as well!!!! There is really nothing that I dislike, Knovio is a great product. Doing great work, keep it up! Having the ability to quickly upload and distribute media is the number one benefit for me!
" A great new tool! " We love that this is a new innovative way to communicate to our customers! We have also found that this is an effective way to introduce new employees to our customers and vendors as well. The videos have proven to be extremely memorable to our audience! I wish there was a way to organize all of our videos more effectively. We have found that a short video can really cut through all the "noise" that our customers get! We have also started using the videos internally as a training tool so we ensure that everyone sees the same message. That we can be there and give the presentation even when we are not there. It has helped us realize that our buyers can give our presentation to the decision maker without us needed to be there. We can still 'give' our presentation at the click of a button. "Knovio gets the job done!" I like the ease of use when uploading videos. The new drag and drop feature is nice. Alos like the showcase feature. Wish there were more features on the quiz section. We recently set up a live training session with KnowledgeVision and were able to find out a lot more useful benefits to our business than we had previous knowledge of. The one-on-one training session was definitely a huge help. "Fine program, but the technology was way behind the times and is just beginning to catch up." Being able to have the slides and video separate and scalable is a really nice feature vs. embedding the slides permanently in the video. Being Flash based is absurd for 2017 and should've been developed a decade ago. Our corporate security is blocking all flash, so our employees are currently unable to watch our live webcasts. KnowledgeVision should've been working on an HTML5 solution back in 2008, not 2017. I love how interactive and well designed Knowledge Vision is to work with. You can create amazing presentations that feature your PowerPoint slides, video, and audio. They are easily shared and you can track the guestbook for more detailed reporting. The audio/video recording time available on an iPad or tablet is only 20 minutes, you can create endless ones on an actual computer but it's harder to set up a multi-person/department presentation this way. Being able to easily explain tutorials has really simplified the way we present. It feels more hands on and personal. Thanks so much for your thoughtful review. We're glad you're enjoying the platform. We will be increasing the recording limits on the iPad soon and releasing a new workflow called Collaborate which will allow you to invite multiple authors to contribute to one presentation. The system makes it very easy to load presentations and recordings. I do not use the software often. A quick snapshot user guide would help tremendously. Product presentations and product overviews. The program functions the way it should for hosting video content. Providing many options for admins to upload content. However, leaves the link exposed to not logged in users. This has been used to our benefit as we provide employees required training prior to their first day however, this would be best as an option rather than a workaround. I believe this tool is best for training and employees with bad intentions could easily exploit the content. KnoledgeVision helps us train new employees effectively with a variety of options. "It's decent for a professional presentation but not worth the price"
There is a trial period and tour that allows the user to first get a grasp on how the product works before actually buying the product. There are also cheaper and free options that work just as well. However if you really need a professional program that gets the job done then KnowledgeVision is for you. The only problem is that the services this program provides is rather spread out in various different apps. Its not hard to switch from program to program but it would be more convenient if they were all in the same place. This program allows user to professionally present information in a concise manner. This program is easier to use than the last program we at at our company. Really enjoyed not being frustrate. I like all of it. I use it to answer customer questions by using educational tools as well as one on one . Correcting errors and answering members benefits questions. Ease of use and great tech support. The videos are easy to use and view. Overall we are very pleased with the performance of the application. I would like to see the ability to have a slide library with audio for reoccurring slides in multiple presentations. Make sure it fits your need and use before implementing. Training is good and can be easily scheduled. safety training for use on a new mobile app and on our website. We are also using Knovio for self-paced internal training presentations. Ability to record and re-record right in the tool. Inability to add audio to Quizzes. And you sh ould be able to re-take the quiz. What I like best about this product is how easy it is to use. We have many speakers do presentations but aren't familiar with this type of technology. After a brief explanation, they can all use this product like pros. There is nothing we dislike about this product. We can easily have our subject matter experts work on their own to create a presentation. Using KnowledgeVision for learning purposes is an excellent way to add a very professional and effective look to any type of training. I could not find anything that I did not like about Knovio. I am still learning some of the great features. Try using this as a learning tool and see what your clients have to say about it. The problem we are solving is providing our clients with information that will help them utilize our software and keep up to date with the latest features. KV Studio and the ability to record slide timings to sync with video later. The synchronization in KV Studio doesn't allow scrubbing of video. KV Central desperately needs dropdown menus for easier navigation. Syncing slides to videos. We have created several hundreds of hours of content easily. "Helpful and easy to use"
I really like that I can quickly and easily merge a PowerPoint and a video together to create an effective training or informational video with quizzes. The viewer reports are a little confusing and can require a lot of time manually manipulating the data to see individual viewership. We are able to get informational trainings out to our field sales group quickly. They are able to view the material without having to read it in an email. I believe the information is retained better. "Great tool to create online presentations"
Knovio is the tool that allows you to combine the assets you have and create online presentations very fast. Its easy to start working with and does not require big learning curve. Give it a try and you will love it! "A good solution for content creation"
The system is very easy to use and the big selling point for me is the excellent video player itself. The ability to customize the player skin is also great. Direct SCORM integration is only available at the higher subscription levels. It's allowed me to roll-out much more engaging training content in conjunction with out current LMS. The attentiveness of the staff and the continuously available training sessions. I don't get to use this service enough in my current position but plan to use it much more in the near future. You have to try to experience the difference. We provide presentations to our large groups for use with their employees. * We monitor all Knovio reviews to prevent fraudulent reviews and keep review quality high. We do not post reviews by company employees or direct competitors. Validated reviews require the user to submit a screenshot of the product containing their user ID, in order to verify a user is an actual user of the product. Hi there! Are you looking to implement a solution like Knovio?